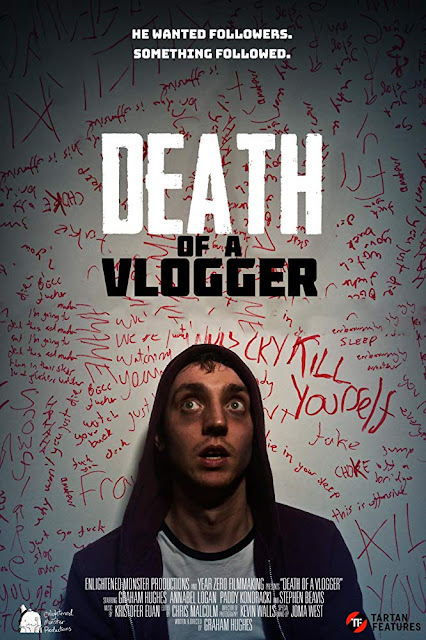 BAFTA New Talent and Michael Powell nominated filmmaker Graham Hughes has released the trailer for his latest, unique horror feature DEATH OF A VLOGGER. It's not easy being a YouTube vlogger. It takes a lot of dedication to conjure up those views, night after night but Graham is about to get some help...from beyond the grave. Tartan 18 - DEATH OF A VLOGGER - Official Trailer 1 from Year Zero : Tartan Features on Vimeo. DEATH OF A VLOGGER will join the pioneering Micro Budget Feature Film collective Tartan Features as part of the New Scottish Cinema: DIY features which punch far beyond their constraints by promoting innovation to find success. Recent additions include DARKNESS COMES, 'RIBBONS', FAR FROM THE APPLE TREE starring The Innocents Sorcha Groundsell and John McPhail's debut feature, WHERE DO WE GO FROM HERE? And of course Graham's previous A PRACTICAL GUIDE TO A SPECTACULAR SUICIDE.